Legend says that Kavin Bharti Mittal, son of Sunil Mittal, founder of Bharti Airtel, was one-day eating golgappas (panipuri) in Connaught Place, New Delhi, and there, he got the idea of launching messenger app Hike. Today, the idea formulated by Kavin has reached another major milestone when it became the first Indian messenger to offer P2P payment platform, based on Unified Payment Interface (UPI), besides offering mobile wallet service. Hike is already a Unicorn startup and boasts of 100 million+ users. With the launch of the payment service, based on UPI, it has comprehensively beaten WhatsApp in this race. Tencent-backed Hike will now aim to repeat the incredible success of WeChat app in China, which is now the largest mobile payment platform in the world. WeChat too is backed by Tencent; and this clearly shows that Tencent wants to leap ahead of WhatsApp or any other messenger app when it comes to dominating the mobile payment landscape in India. Besides, indirectly, Hike will now compete against established mobile wallets such as Paytm, Freecharge and MobiKwik as well. 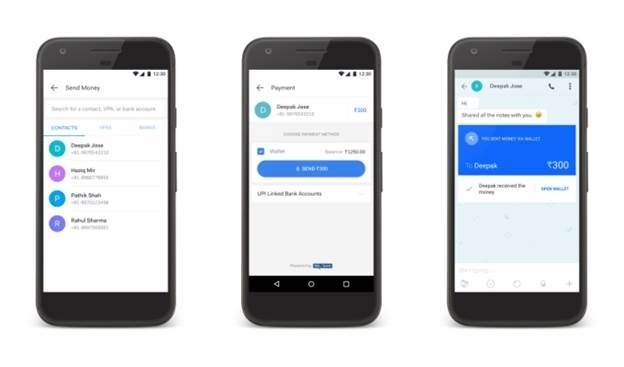 In their latest Hike 5.0 version, the developers have tweaked the UI, introduced a timeline format of sharing posts, besides introducing the P2P payment and mobile wallet platforms. – Blue Packet concept, wherein users can send ‘Blue Packets’ to one another. Each packet can be stuffed with fixed amount of money, say Rs 10 or Rs 100. This idea has been directly borrowed from WeChat, where the tradition of ‘Red Packet’ exists to send money to one another. – Person to person money transfer and full-fledged Digital Wallet, using UPI interface. The payment processing mechanism for P2P and Mobile Wallet would be provided by Yes Bank. Besides, the UPI platform can be also used to send money to the bank or receive money from any bank account, just like how UPI works. As per Mittal, Hike has 100 million users as of now (which we reported last year), and an average user spends close to 24 minutes per day on the app. Are you using Hike messenger? Do let us know your experience, by commenting right here! "Hike Becomes 1st Indian Messenger To Bring UPI Payments & Mobile Wallet! ", 5 out of 5 based on 3 ratings.